Now that it’s getting cold and dark early I’m really enjoying my regular Monday night spin class. Before the time change, it was sort of just a bummer to be inside riding a stationary bike instead of outside riding a real bike, but the gym is where the childcare is easily accessible! I think I overdid it at the playground yesterday. Sometimes I feel like I live at playgrounds these days. Mind you, they’re not bad places to spend large quantities of time, especially when you have a cute little one to play with and going to the playground is an easy activity that requires almost no planning. In the middle of a long work day, I’m all for no planning! Now that I’m gradually getting back into running because my foot is healing, I’m starting slow and easy. Strange thing about my foot- I’ve been seeing so many different doctors and therapists for several months now but it wasn’t until an appointment with my manual therapist last week that it felt better- and stayed that way. I’ve had bits of discomfort but have gone through entire days without a single ache this week. What did he do? He dug painfully deep into my psoas way up near my stomach on the right side and also worked on some bones around the arch of my left foot. And voila! I’m finally healing. So, back to yesterday. 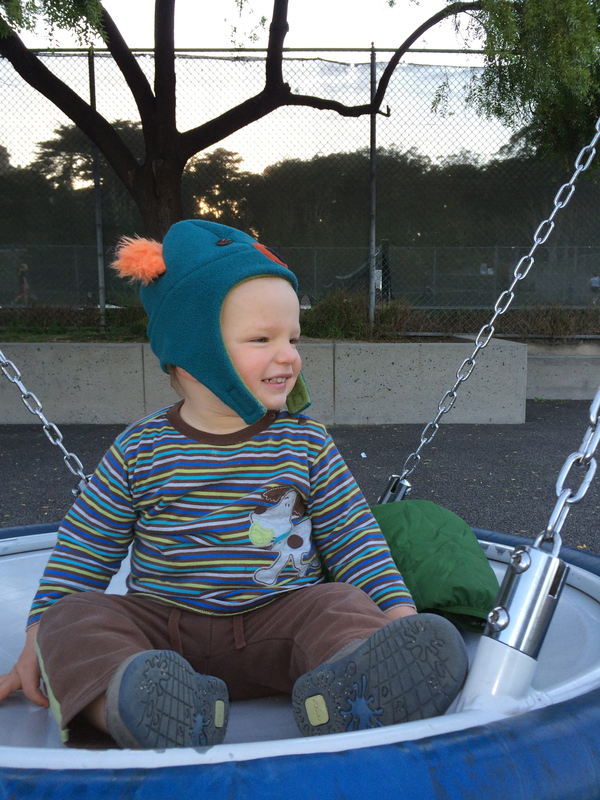 It was already getting dark when Baby A awoke from his nap, so we took an easy jog to the playground about a mile away. While Baby A ran around I used every piece of playground equipment I could to do exercises, which I’ll list at the bottom. This served two purposes- it kept my heart rate up for a more complete, longer workout and it kept me warm until the run home. It wasn’t until late last night in the second act of Wagner that my shoulder started tiring and I thought back to my day. I biked to work, played Barber of Seville in the morning, ran pushing a running stroller, did a full upper body workout at the playground, then performed Flying Dutchman at night. Toward the end of the opera I made a real mess of a scale- I hit the first and last note but nothing in between. It hit me suddenly that I’d pulled a BuBuBuBu P and done exactly what Baby A does when he gets to L-M-N-O-P in his ABCs. I approximated my notes then moved on. I giggled for the rest of the opera. Perhaps next time I’ll take it easy at the playground and aim to keep my BuBuBuBu Ps to a minimum!